It was, all in all, an assured performance by the prime minister. She looked and sounded confident as she delivered her Plan for Britain, as she stated her objectives for the Brexit negotiations. From those who harbour potential worries - such as business or the unions - there has been a degree of grudging respect, allied to lingering anxieties. At least, such comments conceded, Theresa May had now set out to remove some of the Brexit detritus and to clarify the UK government's position. Business, in particular, dislikes uncertainty. Presented with a firm declaration that the UK is leaving the single market, the business instinct will now be to seek to gain the best deal from alternative arrangements. So there will be more than a few cheers for the PM's delivery, determination and detail. However, it might be thought appropriate to note the ironies and even potential contradictions intrinsic to the PM's speech. Irony first, probably deliberate. Mrs May signalled the UK's departure from the European single market in the same opulent chamber where Margaret Thatcher previously proclaimed the benefits of such continental co-operation. Further, Mrs May's persuasive capacity and enthusiasm for a new order are, arguably, just a tiny fraction countered by the fact that she stood on a manifesto which supported the single market - and indeed campaigned (with varying degrees of reported zeal) for retaining British membership of the EU. Then again one or two weary cynics might seize upon her attitude to the remainder of the EU. Britain's departure from the single market was depicted as a vital opportunity to build global links. However, she advised the other 27 EU states to stick firmly together and sustain the single market. Further, still, she noted that President Elect Trump had placed Britain at the front of the line for trade deals, deftly eliding Mr Trump's other comments in which he has stressed his determination to put American interests first, while questioning the value of existing free trade agreements. However, one understands entirely. Things have changed. Britain has voted to quit the EU - despite what Mrs May called David Cameron's "valiant, final attempt" to make British membership work. The PM has to deal with the future, not the past. She takes the EU institutions at their word when they say that membership of the single market requires endorsement of the four fundamental freedoms, including freedom of movement. That, she says, is incompatible with the desire of the British people to regain control over borders and immigration. Hence, Britain is out of the single market and the EU. There is, of course, much more. She talks of building global trade and Britain's place therein. She talks of maintaining access to trade with EU states, tariff free if feasible. She talks of maintaining co-operation on a wide range of topics from action on crime and terror to academic interchange. She talks of leaving the EU - but staying close chums with Europe. She is, in short, making the very best she can of a situation created by the referendum: albeit that the plebiscite was initially forged by the Conservatives. What then of Scotland? Supporters of the SNP will point to what they regard as a further contradiction. When Theresa May talks of heeding the voice of the people in this matter, supporters of the SNP say: "Which people?" Remember that the Scottish government's policy paper, delivered in December, had broadly three tranches. One, the UK should stay in the single market. That is bust after today. Two, the UK should assist Scotland to stay in the single market as part of a special deal, possibly emulating Norwegian membership of the European Economic Area. Three, if one and two fail, then a further referendum on independence should be considered. To be clear, Mrs May went out of her way to stress the role of the devolved administrations in formulating the overall deal which will accompany the UK's departure from the EU. She emphasised this point repeatedly. In the audience, the Scottish Secretary David Mundell nodded appreciatively. But there was no talk of a special deal for Scotland. Quite the reverse. The talk was of the UK as a whole seeking negotiations. The talk was of the UK as a whole leaving the EU and the single market. The talk was of the UK as a whole seeking to build new global links. Indeed, Mrs May stressed that nothing must be done which would jeopardise trading links within the UK - within what she called the "precious union" of the United Kingdom. Since that is precisely the complaint aimed by Mr Mundell and others at the Scottish government's plan, that can be read as sidelining any notion of a special deal assisted by the UK government. Nicola Sturgeon knows that. 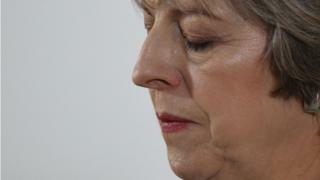 She conceded that the content and tone of the PM's speech did not sound like a special deal was in the offing. But Ms Sturgeon told me she would persist in seeking a compromise, including in talks this Thursday. Again, to be clear, the PM has promised that the Scottish government's plan will be considered in the mix. But what if the answer is no? What if there is no special deal to allow Scotland to remain in the single market: the issue now identified by the FM as the core of her demands? I asked Nicola Sturgeon if that meant an independence referendum was now closer. She replied, without equivocation, "Yes" - then expounded on why. I then asked Ms Sturgeon whether today's developments made an independence referendum "all but inevitable". The ever-cautious FM hesitated very, very slightly - then replied: "I think that is very likely the case."